← Kindle Price Drop – A MILLION LITTLE GODS: THE CLEARWATER CHRONICLES $0.99! FREE KINDLE DOWNLOAD THIS WEEKEND – SATURDAY & SUNDAY!!! What began as a simple writing exercise soon turned solid. And what remains is a literary cavalcade of mixed metaphors and images painted on a mental canvas with delicacy and precision. 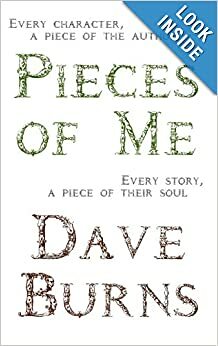 Pieces of Me is a step behind the curtain into the author’s mind. Told through a disembodied narrator, the reader bounces between time and space – between the here and now, and the intricate details of the author’s broken past that have woven their way into his tales. Both Fun and Fascinating – You Will Want to Read it Twice! A marvelous fantasy grounded in a moving reality. Burns’ poetic use of alliteration alone makes the story worth the read. Don’t let this one slip by. Reading Burns isn’t the reading, it’s the experience. This entry was posted in Uncategorized and tagged Amazon, Author, Coraline, Dave Burns, Download, Dr. Seuss, free, Indie, Kindle, Look Inside, Neil Gaiman, Pieces of Me, Tim Burton, Uncarvedbooks, William Shakespeare. Bookmark the permalink.